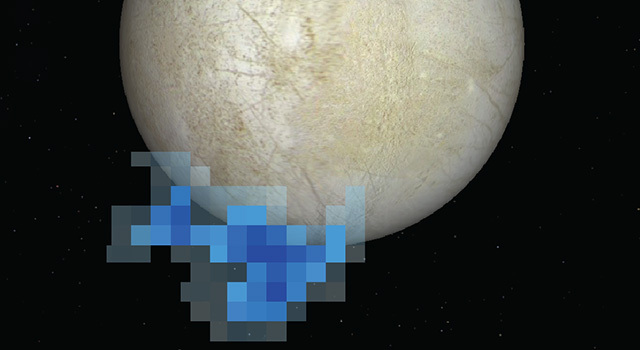 "By far the simplest explanation for this water vapor is that it erupted from plumes on the surface of Europa," said lead author Lorenz Roth of Southwest Research Institute in San Antonio. "If those plumes are connected with the subsurface water ocean we are confident exists under Europa's crust, then this means that future investigations can directly investigate the chemical makeup of Europa's potentially habitable environment without drilling through layers of ice. And that is tremendously exciting." In 2005, NASA's Cassini orbiter detected jets of water vapor and dust spewing off the surface of Saturn's moon Enceladus. Although ice and dust particles have subsequently been found in the Enceladus plumes, only water vapor gases have been measured at Europa so far. 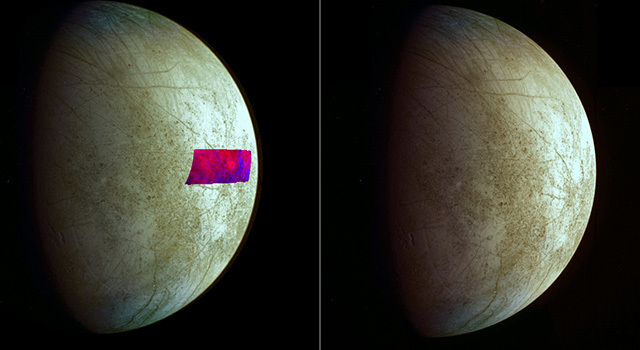 The imaging spectrograph detected faint ultraviolet light from an aurora, powered by Jupiter's intense magnetic field, near the moon's south pole. Excited atomic oxygen and hydrogen produce a variable auroral glow and leave a telltale sign that are the products of water molecules being broken apart by electrons along magnetic field lines. "We pushed Hubble to its limits to see this very faint emission. These could be stealth plumes, because they might be tenuous and difficult to observe in the visible light," said Joachim Saur of the University of Cologne, Germany. Saur, who is principal investigator of the Hubble observation campaign, co-wrote the paper with Roth. Roth suggested that long cracks on Europa's surface, known as lineae, might be venting water vapor into space. 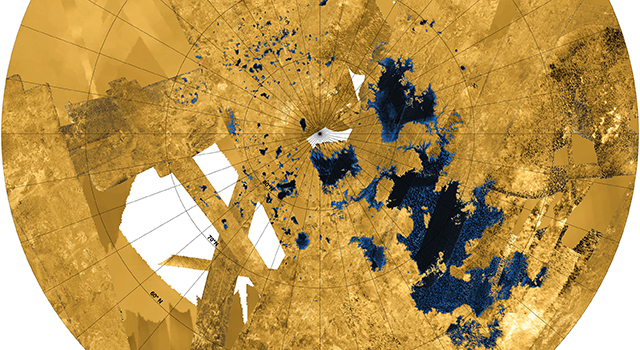 Cassini has seen similar fissures that host the Enceladus jets. Also the Hubble team found that the intensity of the Europa plumes, like those at Enceladus, varies with Europa's orbital position. Active jets have only been seen when the moon is farthest from Jupiter. 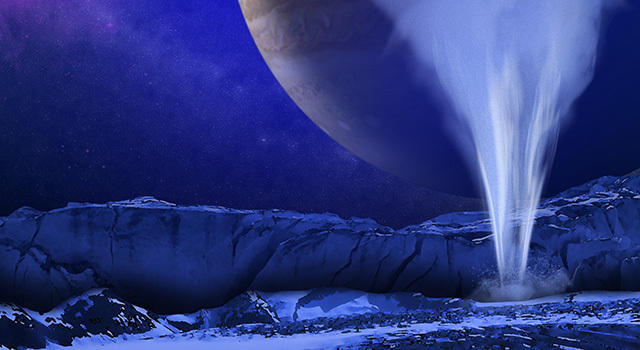 The researchers could not detect any sign of venting when Europa is closer to Jupiter. The Europa and Enceladus plumes have remarkably similar abundances of water vapor. Because Europa has a roughly 12 times stronger gravitational pull than Enceladus, the minus-40-degree-Fahrenheit (minus-40-degree-Celsius) vapor for the most part doesn't escape into space as it does at Enceladus, but rather falls back onto the surface after reaching an altitude of 125 miles (201 kilometers), according to the Hubble measurements. This could leave bright surface features near the moon's south polar region, the researchers hypothesize. "If confirmed, this new observation once again shows the power of the Hubble Space Telescope to explore and opens a new chapter in our search for potentially habitable environments in our solar system," said John Grunsfeld, an astronaut who participated Hubble servicing missions and now serves as NASA's associate administrator for science in Washington. "The effort and risk we took to upgrade and repair Hubble becomes all the more worthwhile when we learn about exciting discoveries like this one from Europa." To view the images of the evidence for plumes visit: http://www.nasa.gov/content/goddard/hubble-europa-water-vapor . For more information about the Hubble Space Telescope, visit: http://www.nasa.gov/hubble .